This weekend, Portland Timbers and Sporting Kansas City played out a goalless draw in the first leg of the MLS Western Conference Final. This leaves everything nicely poised for the 2nd leg, but how did each team to go in ahead? 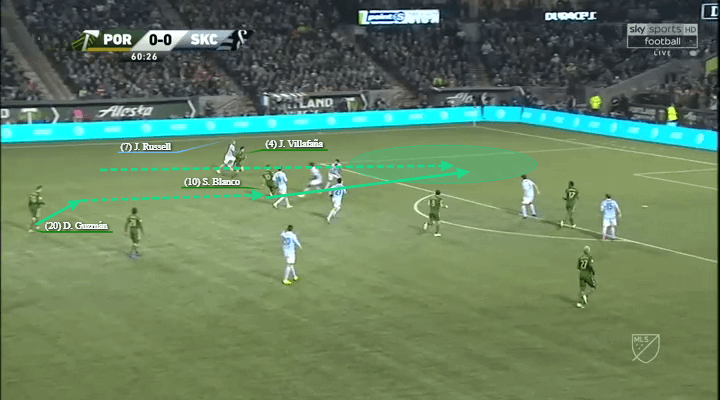 In this tactical analysis, I’ll examine how each team approached the game. Along with that, I’ll look at how that either benefitted or hindered them. 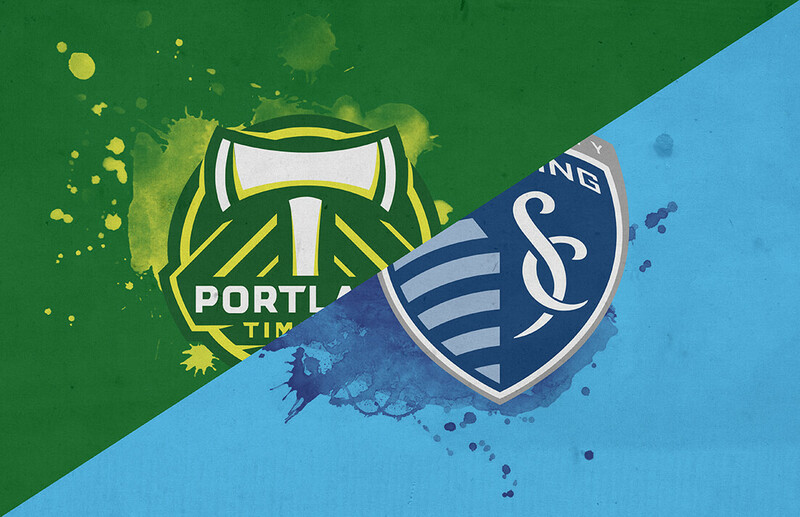 With the 2nd leg taking place late on Friday night (2:30am GMT) I will then give my verdict as to who I believe will make the MLS Cup Final. The biggest change going into this game was SKC’s approach. Usually they are the team who like to impose themselves on their opponents, however, this didn’t quite happen on Sunday. SKC were without ten-goal Diego Rubio due to suspension. 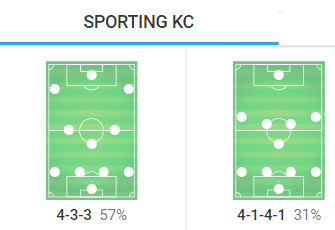 To deal with this, SKC reverted from their usual 4-3-3 to a more defensive 4-1-4-1. With their wingers, Jonny Russell and Daniel Salloi positioned so deep, they couldn’t quite attack teams as they usually would. Shelton does well to keep the ball as a lone striker and make his way towards the box. 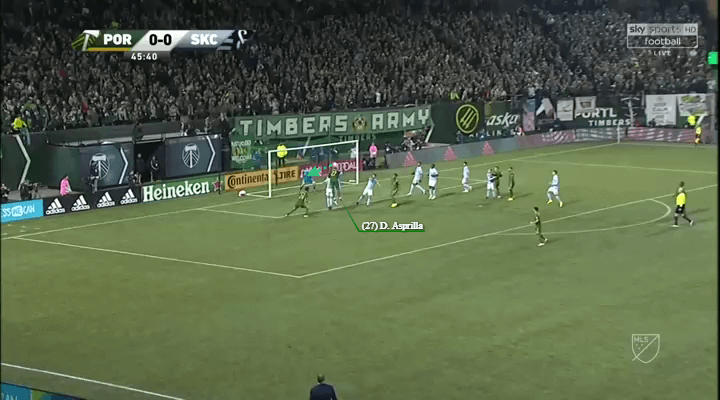 However, SKC are outnumbered so his only clear pass is back to the edge of the box for an onrushing Russell. Russell takes the ball in his stride. But due to the volume of bodies in the box he’s hurried into his shot which flies over. At this point in the game, SKC’s attack wasn’t very convincing. 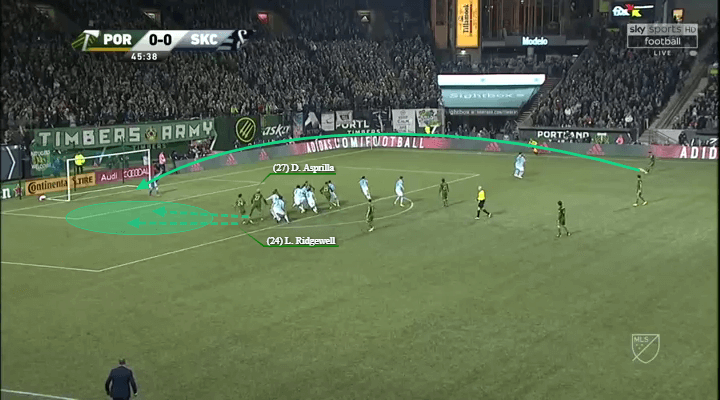 The depth at which their runners had to come from ate valuable seconds and made it that much easier for Portland to defend them. However, Russell did try to change this later in the game. Later in the game, SKC played more of their natural game. This meant that Russell could position himself higher up the game which caused trouble for Portland. With Diego Rubio returning and a possible revert to 4-3-3, this could help in the 2nd leg. 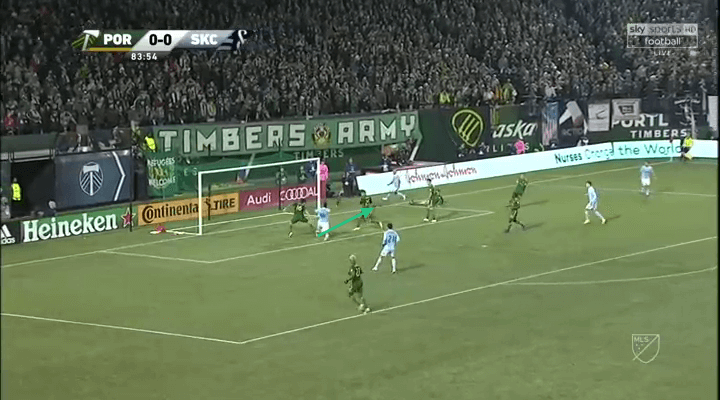 With Russell higher up the pitch, this gives his right back (Zusi) a chance to overlap. This forces Portand’s left back to follow Zusi’s run and creates space for Russell to attack. Russell does this and makes his way to the byline. Having sped through such a compact defence, there is now a clear space at the back post. If he hits this, Shelton should score. To Portland’s credit, they defended doggedly and somehow Valentin intercepts. The ball falls to Russell again but he can’t find another SKC shirt in the box. Here we see just how much havoc SKC can cause when they’re on the front foot. Rather than allowing Portland to dictate what happens, they did through Russell. With this, we see just how important he can be in the 2nd leg. He can put doubt into the minds off defenders, especially if he has Zusi overlapping, so don’t be surprised to see him heavily involved in the 2nd leg. As we saw earlier, Portland were very good at crowding their box. This principle wasn’t just executed in their final third, however. In my preview for this game, I mentioned how important Diego Chara would be when Portland are out of possession. This proved to be the case as one of their biggest chances from open play came from his press. SKC’s Felipe Gutierrez gets onto the ball under pressure from Diego Valeri. As he begins to spin into space, Chara notices this and sprints forward to close that space and put pressure on Gutierrez. Gutierrez is now scrambling as Chara and Valeri look to pinch the ball from him. Panicking, he tries to get the ball away in any way possible. His attempted pass is picked up but Portland’s deepest midfielder, David Guzman. Guzman immediately lays the ball off to danger man Sebastian Blanco. Blanco advances which pulls defenders towards him and creates space in behind for Villafana. Once Villafana was in behind, Johnny Russell was the wrong side of him. This saw the two collide but luckily for SKC a penalty wasn’t given, however, it would’ve been understandable if one was given. This type of play is something that Portland should take real encouragement from. With Chara, they’re able to set the agenda during games and put themselves in the driver’s seat. As shown above, this can change games in a matter of seconds and possibly put Portland in the lead. This is a gameplan that must continue in the 2nd leg, especially as it is at SKC’s home, Children’s Mercy Park. 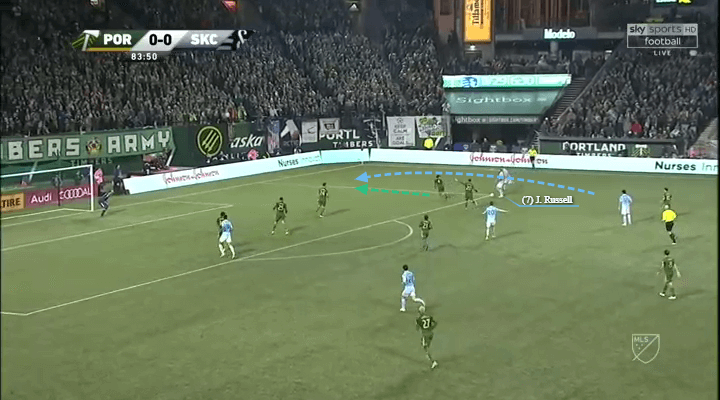 As aforementioned, the above example was one of Portland’s best chances from open play. However, the best chances overall came from set pieces. 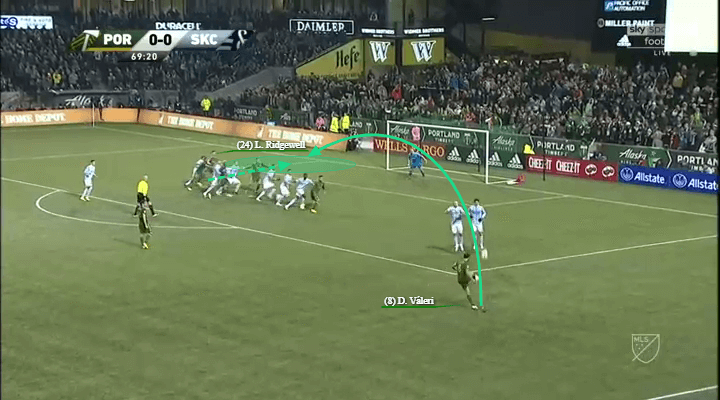 With Diego Valeri, Portland carry a massive threat from set pieces due to their delivery. Not only this but they also carry some height into the opposition box to meet those deliveries. This was seen on a couple of occasions on the weekend where they could’ve profited. Here, we see Portland’s set piece plan clearly. 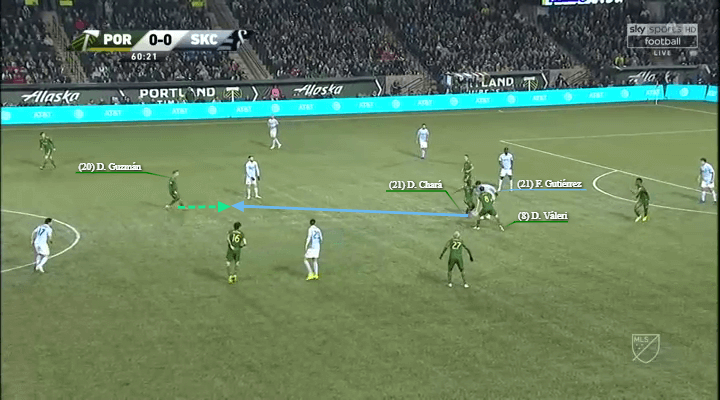 Valeri will curl the ball deep into the box towards the far post. Liam Ridgewell will be the furthest Portland player to try and knock it back and he is joined by another player just in case the ball falls short. In this instance, the ball falls to Asprilla who jumps well but heads straight at the keeper. Here we see the same plan executed. A ball curled deep into the six yard box where the keeper can’t claim it and is too far for the defenders to reach. Liam Ridgewell is the target. Nevertheless, that is another method of attack where they can put their mark on the 2nd leg. SKC could train to specifically combat this, but as we all know, a perfect pass can undo some perfect defending. Overall, I’d say Portland performed better on the night. However, not scoring could prove very costly in a couple of days. Diego Rubio will be back and SKC, in front of their home fans will, without doubt, be a different proposition. However, if Portland take the details which I’ve outlined into the 2nd leg, I’d expect another close game which could go down to the wire. One thing’s for sure, this will be one for all to watch in suspense.